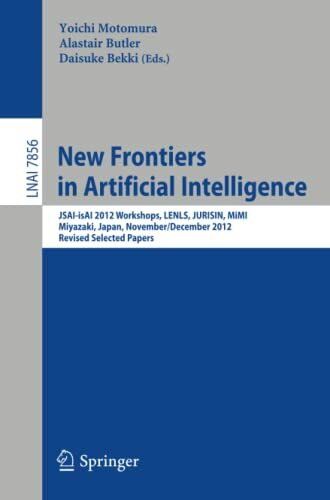 [PDF] New Frontiers in Artificial Intelligence: JSAI-isAI 2012 Workshops, LENLS, JURISIN, MiMI, Miyazaki, Japan, November 30 and December 1, 2012, Revised Selected Papers (Lecture Notes in Computer Science) | Free eBooks Download - EBOOKEE! Description: The 17 contributions in this volume were carefully reviewed and selected from 42 submissions.They are an excellent selection of papers that are representative of topics of AI research both in Japan an in other parts of the world. LENLS (Logic and Engineering of Natural Language Semantics) is an annual international workshop on formal semantics and pragmatics its topics are the formal and theoretical aspects of natural language. JURISIN (Juris-Informatics) deals with juris-informatics. No comments for "[PDF] New Frontiers in Artificial Intelligence: JSAI-isAI 2012 Workshops, LENLS, JURISIN, MiMI, Miyazaki, Japan, November 30 and December 1, 2012, Revised Selected Papers (Lecture Notes in Computer Science)".